Below are the FREE Sample of the Texas DPS Practice Test Online. 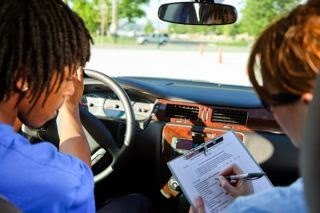 These questions and answers help you easily prepare for and pass the Texas Driver's License Written Test. The written driving test questions might be tricky. But with the right preparation, you can get the confidence to pass the first time. The Free Texas Practice Permit Test includes question on Texas State Laws, rules of the road, traffic signals, laws, signs and safety. Going through this real-time TX DPS Practice Test Q & A (s) will increase your chances of passing your Texas learner's permit exam on your first try. 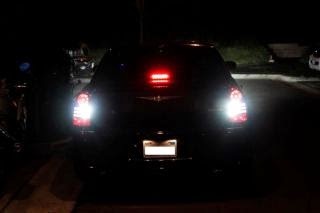 within 500 feet of an approaching vehicle, following within 300 feet of another vehicle, or driving on well-lit roads. Q2: The law of Texas requires that _________ in a passenger vehicle must wear seat belts all the time. 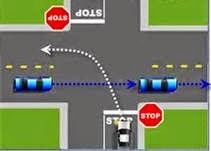 Q4: If you wish to make a turn, you should signal continuously for at least_________ before you actually make the turn. Q6: What does this sign mean? 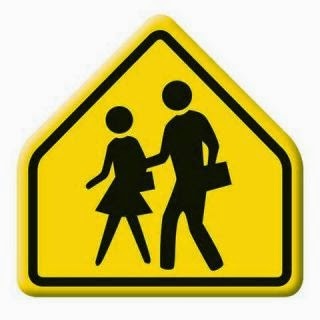 *Hint: This sign means that you are near a school. Slow down, and prepare to stop suddenly if necessary. Watch for children. 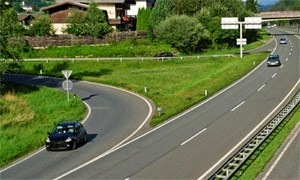 Ans: down to the lower right side of the road. *Hint: When oncoming headlights temporarily blind you, avoid looking directly into the headlights of the approaching vehicle. You should shift your eyes down to the lower right side of your traffic lane. *Hint:This no-passing zone sign indicates that the distance you can see ahead is so limited that passing another vehicle is not permitted. 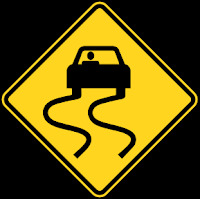 *Hint:This sign warns that the road surface ahead is slippery when wet. This sign is often located near bridges and overpasses. Do not suddenly turn, speed up, or stop. Q 1. 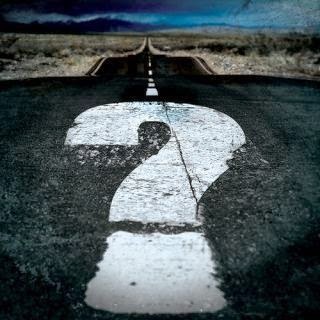 If you are driving on an unpaved road that intersects with a paved road, which vehicle has the right of way? Q 2. What does Texas law say about bicyclists on roadways? Q 3. On a level highway, how much longer does it take to pass a truck than a car? Q 4. Drugs and alcohol are a contributing factor in what percentage of fatal crashes in Texas? Q 5. When you want to change lanes, how can you see if another vehicle is in your blind spot? Q 6. If you are moving to Texas, how long do you have to obtain a driver’s license? Q 7. How close to the curb should you park when parallel parking? Q 8. If you are involved in an accident that is not investigated by law enforcement, and the crash resulted in death or more than $1,000 in property damage, how soon afterwards must you file a report with the Texas Department of Transportation? d) 10 days from the date of the accident. Q 9. Under Texas’ “Zero Tolerance Law” what is the penalty for the first offense for a minor who tries to buy alcohol with a fake driver’s license that says they are 21 years old? Q 1. In a passenger car or truck (with a manufacturers rated carrying capacity of not more than 1500 pounds) which of the following must use safety belts? c) Only the front seat passengers. Q 4. 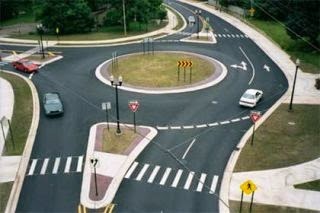 Which car is NOT using the roundabout correctly? a) All of the cars are using the roundabout correctly. Q 6. 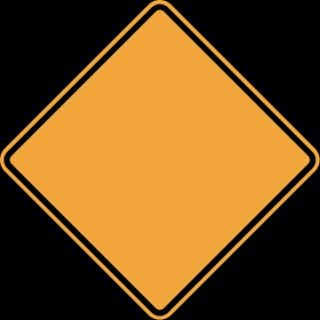 What does an orange sign mean? a) Allow the motorcycle to use only half a lane. b) Pass in the same lane where the motorcycle is driving. c) Drive on the shoulder beside the motorcycle. d) Allow the motorcycle to use a complete lane. ANS: Allow the motorcycle to use a complete lane. a) Pull off the road and away from traffic. b) Stop your vehicle over a hill or just around a curve for visibility. c) Lift the hood to signal an emergency. ANS: Pull off the road and away from traffic. Hint: If your vehicle breaks down on the road, make sure that other drivers can see it. If you are having vehicle trouble, and need to stop, follow these rules: Pull off the road away from all traffic, if possible. Turn on your emergency flashers. 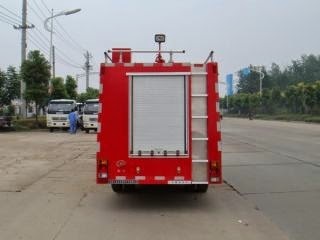 Lift the hood to signal the emergency and place emergency flares or triangles. Q 9. Keeping a steady speed and signaling in advance when slowing down or turning will help maintain what? a) A safe distance next to your vehicle. b) All of these choices. c) A safe distance ahead of your vehicle. d) A safe distance behind your vehicle. ANS: A safe distance behind your vehicle. a) Continue with the same speed. b) Proceed from the left side with caution. c) Come to an immediate stop. ANS: Come to an immediate stop. 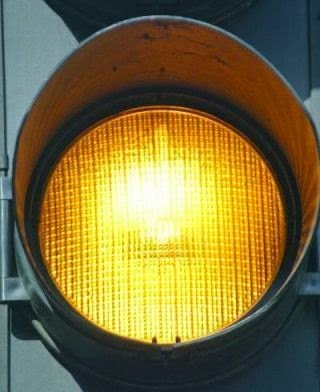 HINT: A steady yellow signal warns you that it is about to change to red. If you are approaching the intersection, you must stop. However, if you are already within the intersection and there is no conflicting traffic present, you may complete your maneuver. a) He or she has a mental disability. b) He or she is blind. c) He or she is deaf. 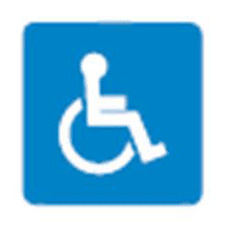 d) He or she has a physical disability. ANS: He or she is blind. a) From the right lane make make the turn close to the right curb. b) From the left lane make make the turn close to the right curb. c) From the left lane make make the turn close to the left curb. d) From the right lane make make the turn close to the left curb. ANS: From the left lane make make the turn close to the left curb. HINT: To turn left from a one-way street to another, a driver must begin the turn from the left lane and make the turn close to the left curb. Q 13. 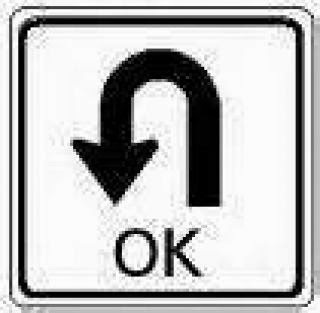 Which of the following road rules about turning is NOT correct? a) When making turns, go from one lane to the other as directly as possible without crossing lane lines. b) When making a left turn, avoid cutting the corner sharply. c) When making a right turn, avoid swinging wide to the left. d) Where there are no signs to control turning, you must turn into the lane farthest from the one you came from. ANS: Where there are no signs to control turning, you must turn into the lane farthest from the one you came from. HINT: Where there are no signs or lane markings to control turning, you should turn from the lane that is closest to the direction you want to go and turn into the lane closest to the one you came from. This way, you will cross the fewest lanes of traffic. Q 14. 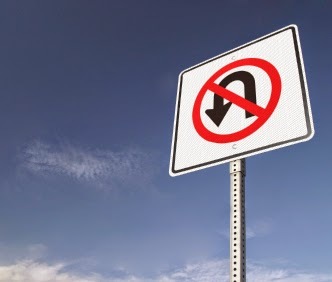 In which of the following places is a U-turn permitted? a) On a railroad crossing. b) In a business district. c) Across a double yellow line. d) On a one-way street. ANS: Across a double yellow line. HINT: U-turns are permitted across double yellow lines when safe to do so. They are not permitted in business districts, on one-way streets, or on railroad crossings. a) All of these visual elements. d) Depth and color perception. ANS: All of these visual elements. 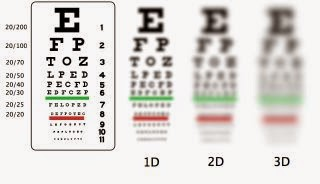 HINT: The eye test evaluates: 1) Acuity - how clearly you see 2) Peripheral vision - how far you can see to either side while looking straight ahead 3) Depth and color perception. Q 16. Car B wants to cross this divided highway. Who has right of way, and why? 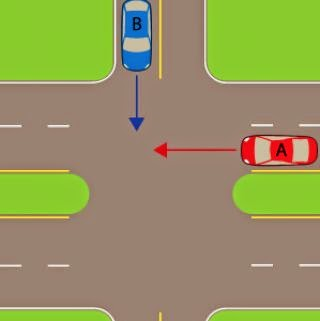 a) Car B has the right-of-way because it is to the right of Car A.
b) Car B has the right-of-way because it is on a smaller road than Car A.
c) Car B has the right-of-way because it has arrived at the intersection first. d) Car A has right-of-way because it is on a larger road than Car B.
ANS: Car A has right-of-way because it is on a larger road than Car B. HINT: Drivers are required to yield when entering a multi-lane road from a smaller road. In this case, Car B has to yield. HINT: Two sets of solid, double, yellow lines spaced two or more feet apart are considered a barrier. Do not drive on or over this barrier, make a left turn or a U-turn across it, except at designated openings. HINT: If there is not enough room for taking a U-turn, you may consider a three-point turn. This will put you in the opposite direction. 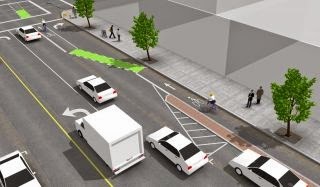 This turn should only be used when the street is narrow, there is good visibility, the traffic is light, the turn is legal and there is no other option. a) In the rightmost lane. b) In the leftmost lane. c) In the center lane. ANS: In the leftmost lane. HINT: If you are making a left turn, you must begin in the leftmost lane. Q 20. _________ indicates the outside edge of the traffic lane, and may be crossed only by traffic moving to or from the shoulder. crossed only by traffic moving to or from the shoulder. Q 21. What does this yellow warning sign mean? a) A heavy truck is moving. b) A dangerous goods truck is moving. c) An emergency vehicle is moving. d) A high occupancy farm vehicle is moving. ANS: An emergency vehicle is moving. 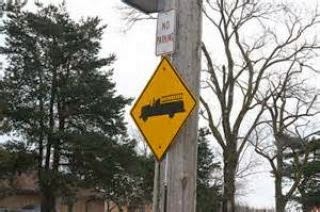 HINT: This is an emergency vehicle sign. The right-of-way must be given to emergency vehicles approaching from any direction when they are sounding a siren or using their flashing lights. a) Stop. Yield to all cross traffic before crossing the intersection. b) Stop before entering the intersection as long as you can do so safely. c) Only yield to emergency vehicles. d) Slow down and cross the intersection carefully. ANS: Slow down and cross the intersection carefully. a) To turn into a driveway. b) To pass a car if traffic permits. c) When driving on the left. d) To pass a slow moving truck. ANS: To turn into a driveway. HINT: Double solid lines: You may not pass, or change lanes. You may not cross the lines except when turning left to enter or leave the highway (e.g., to or from a driveway or to perform a U-turn. Q 24. 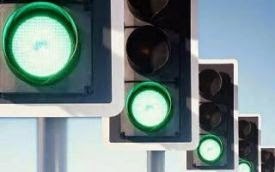 You arrive at a crossroad with a green traffic signal. You wish to drive straight through the intersection. Which of the following is true? 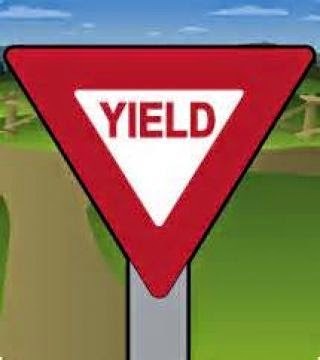 b) You must briefly come to a stop, yield, and then you may proceed. c) You are free to proceed, so long as you yield to any traffic already in the intersection. d) You are free to proceed. ANS: You are free to proceed, so long as you yield to any traffic already in the intersection. 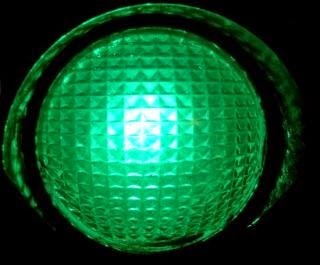 HINT: You can proceed on a green signal. 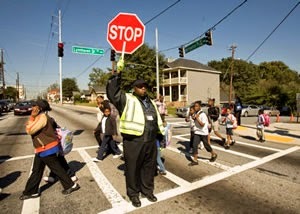 However, you must still yield to any traffic or pedestrians which are already in the intersection. Q 25. 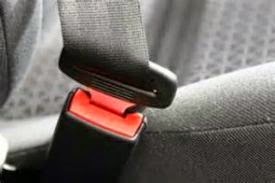 Which of the following is true about seat belts? a) All of these choices. b) You must wear a seatbelt while driving. c) Every passenger must wear a seatbelt or suitable child restraint. d) Passengers can also be cited for not wearing their seat belts. ANS: All of these choices. HINT: You must ensure that everyone in your vehicle is wearing their seat belt. You and your passengers can be cited for not wearing their seat belts. Children must be secured in an appropriate child restraint. a) Walk on the right shoulder with the flow of traffic. 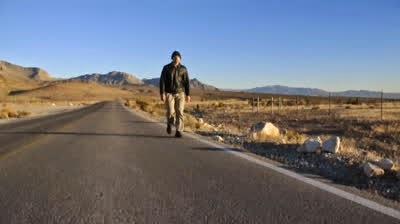 b) Never walk on the highway as it is illegal. c) Walk in the middle lane to call for help..
a) At least 100 feet. b) At least 200 feet. c) At least 500 feet. d) 3 to 6 seconds. ANS: At least 500 feet. Q 28. You must come to a complete stop before reaching a school bus which has stopped for passengers with its red lights flashing. When can you proceed? a) When the bus resumes motion. b) When the flashing red lights are switched off. d) When the driver signals you to pass. 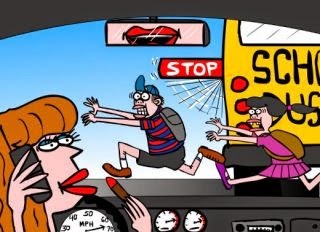 HINT: You must stop behind a school bus which has stopped for passengers with its red flashing lights on. You cannot proceed until the red lights are switched off, the bus is in motion, or the bus driver has waved you through. When you do proceed, drive with care and keep watch for pedestrians. Q 29. What does this sign indicate? 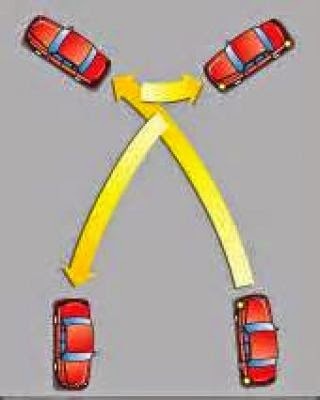 a) Traffic moves in a counter-clockwise direction. c) Expect delays on the rotary. d) Entering a two-way traffic circle. HINT: This sign means that a circular intersection or a roundabout is ahead. 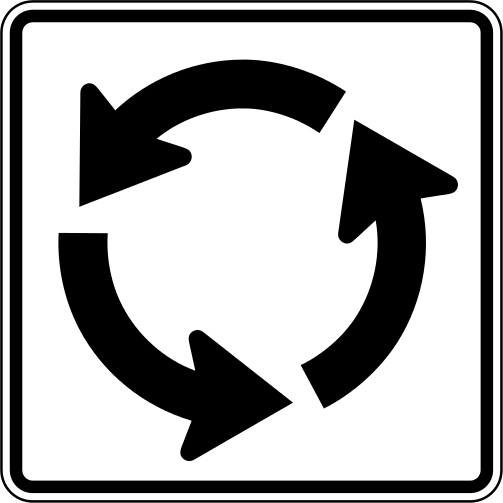 A roundabout is a one-way traffic circle designed to keep traffic moving. It also reduces delays, crashes, fuel consumption, air pollution and construction and maintenance costs. b) At a speed of 55 mph on all highways. c) 10 mph faster than the posted speed limits. d) 20 to 25 mph slower than the traffic on the freeway. a) Moving in the opposite direction. c) Moving in the same direction. ANS: Moving in the same direction. 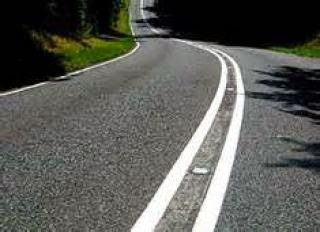 HINT: Double solid white lines separate two lanes of traffic going in the same direction. They are most commonly seen on interstates. Crossing double solid white lines is prohibited. a) When passing to the right on a one-way street. b) When the car in front is disabled. c) When turning left into a driveway. d) When doing so would interfere with traffic. ANS: When doing so would interfere with traffic. HINT: Single broken line: You may pass other vehicles or change lanes if you can do so safely and not interfere with traffic. a) No driving in reverse. a) Stop and wait for the next signal. b) Make sure there are no more vehicles coming through or still in the intersection. c) Watch for the turning traffic. d) Drive your vehicle as quickly as possible through the intersection. ANS: Make sure there are no more vehicles coming through or still in the intersection. 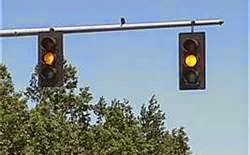 HINT: When a traffic signal turns green at an intersection, make sure the way is clear of any other vehicles that might be still coming through or in the intersection. Most accidents at traffic signals happen in the first few seconds after the light has changed. Yield to any pedestrians who are still on the road. Q 35. 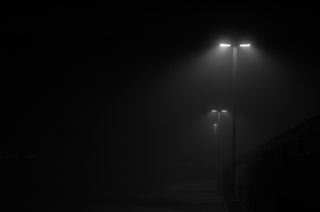 One of the most important things to remember about driving at night or in fog is to? a) Drive within the range of your headlights. b) Watch for cars at intersections. c) Be ready to brake more quickly. d) Use your high beams at all times. ANS: Drive within the range of your headlights. a) Traffic must take a detour. b) Traffic must go straight. c) Drivers must stop their vehicles. d) Traffic must leave the work zone area. ANS: Drivers must stop their vehicles. 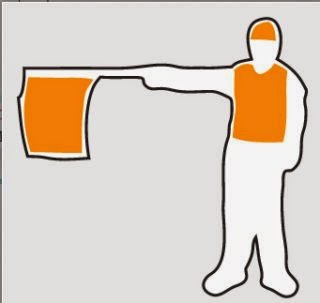 HINT: Flaggers normally wear orange vests, shirts or jackets and use red flags or paddles to direct traffic safely through work zones. This flagger requires the traffic to stop at the sign. Q 37. What should you do if an emergency vehicle is pulled over? a) You should slow down and merge into another lane. b) You must remain in your lane, merging would only cause another hazard. c) You are required to leave an empty lane between yourself and the emergency vehicle, but only when the speed limit exceeds 40 mph. d) You should pull over and park behind the emergency vehicle. ANS: You should slow down and merge into another lane. 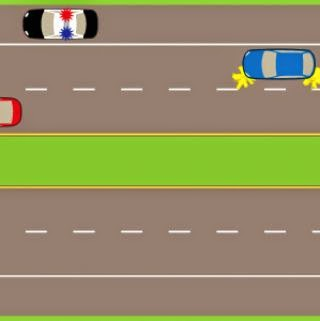 HINT: You must slow down and leave an empty lane between yourself and the emergency vehicle. If you have to merge, do so with caution. NOTE - You are required to leave an empty lane between your car and the emergency vehicle if it is safe, otherwise reduce speed by 20 mph. Q 38. What is a roundabout? b) An intersection where traffic travels around a central island in a counter-clockwise direction. c) An intersection without a center island. 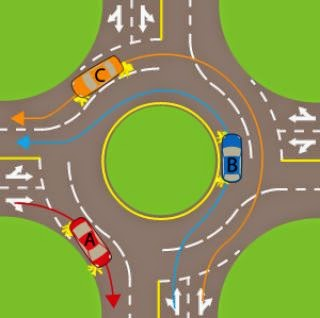 ANS: An intersection where traffic travels around a central island in a counter-clockwise direction. HINT: A roundabout is an intersection where traffic travels around a central island in a counter-clockwise direction. 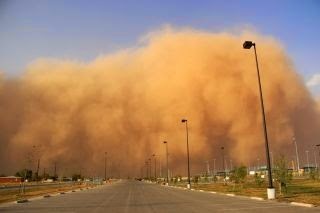 a) Be cautious and drive through it, since dust storms usually don’t last very long. b) Slow down, carefully pull completely off the road, turn off your lights, take your foot off the brake and wait until the storm passes. c) Pull off to the shoulder and turn on your hazard lights. Wait for the storm to pass. d) Slow down, carefully pull completely off the road, turn on your lights and wait until the storm passes. ANS: Slow down, carefully pull completely off the road, turn off your lights, take your foot off the brake and wait until the storm passes. Q 40. Before backing up your vehicle, you should look to the front, sides and rear, and continue to look _________ while backing. HINT: Before backing up your vehicle, you should look to the front, sides and rear, and continue to look to the rear while backing. Q 41. You drive up to an intersection and you see this sign. What should you do? a) Slow down and prepare to yield to pedestrians and traffic ahead. b) Come to a complete stop and proceed after yielding to any pedestrians. c) Slow down and prepare to yield to traffic already on the road ahead. You will definitely not need to stop. d) Maintain speed as all traffic ahead must yield to you. ANS: Slow down and prepare to yield to pedestrians and traffic ahead. HINT: You must slow down and prepare to yield to traffic ahead. You may be required to stop, so be ready. a) Already in a traffic circle. c) Already in an intersection. HINT: If drivers approaching from opposite directions reach an intersection at about the same time, a driver turning left must yield to approaching traffic going straight or turning right. b) A hospital zone ahead. d) A school zone ahead. ANS: A school zone ahead. 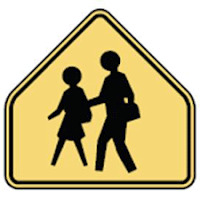 HINT: This sign indicates a school zone. Motorcycle riders must slow down and come to a complete stop, if necessary. Q 44. 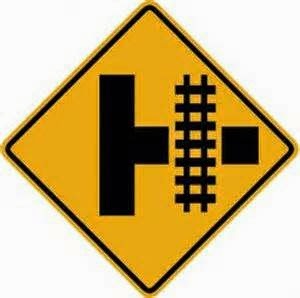 What does this intersection sign mean? a) An intersection for crossroads. b) A T-junction of a highway. c) A side road at a railroad crossing. d) A chevron at a railroad crossing. ANS: A side road at a railroad crossing. HINT: A warning of a railway crossing very close to the intersection (side road railroad crossing). Use caution when crossing tracks. Q 45. Before reaching the crest of a hill or entering a curve, you must _________ and watch for oncoming vehicles. 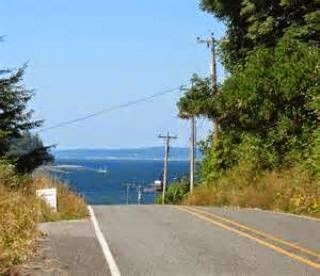 HINT: Hills and curves on rural roads are often steeper and sharper than on highways. Before reaching the crest of a hill or before entering a curve, slow down, move to the right side of the road and watch for oncoming vehicles. Q 46. Which of the following right-of-way rules is not true? a) You must obey signals by a law enforcement officer, even if the officer's signals contradict the traffic signals. 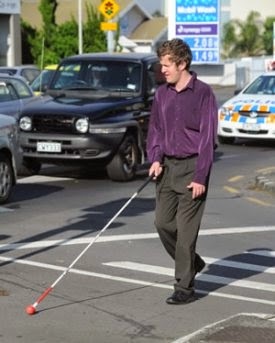 b) Pedestrians using a guide dog carrying a white cane have absolute right-of-way. c) Drivers must yield the right-of-way at all times to pedestrians who are in a marked or unmarked crosswalk. d) At an intersection where there is no stop sign, yield sign, or oncoming traffic signal, drivers must yield to vehicles coming from the left. ANS: At an intersection where there is no stop sign, yield sign, or oncoming traffic signal, drivers must yield to vehicles coming from the left. HINT: At an intersection where there is no stop sign, yield sign or oncoming traffic signal, drivers must yield to vehicles coming from the right. a) Weave from lane to lane. c) Watch for slower speed limits. ANS: Weave from lane to lane. 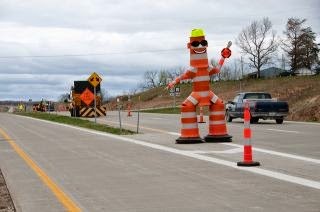 HINT: When approaching or driving through a work zone, observe what other drivers are doing and avoid sudden moves. Do not weave from lane to lane. Brake gradually to give drivers behind you ample time to slow down. Keep up with the flow of traffic. Q 48. This car's turn and brake signals have failed, so the driver is using hand gestures to signal instead. What is the driver's intention? HINT: The driver intends to turn right. Q 49. 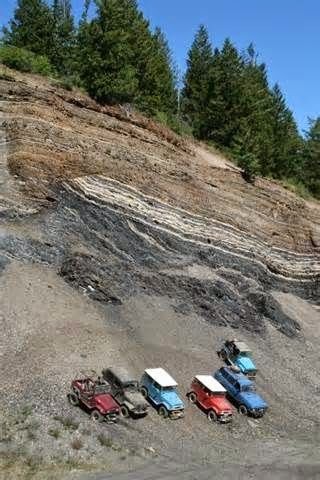 You have parked facing down a steep hill. If you drive an automatic you should leave your car in PARK. What gear should you use with a manual? a) Leave your car in neutral. b) Leave your car in top gear. c) Leave your car in reverse. d) Leave your car in first gear. ANS: Leave your car in reverse. HINT: If you parking on a hill in a manual, you should use your gears to oppose the pull of gravity. 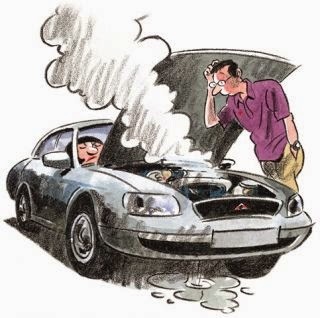 That way your engine will stop your car from rolling if your brakes were to fail. a) Make sure that the vehicle is in safe operating condition. b) Make sure that the vehicle has the required equipment. c) Neither of these choices. d) Both of these choices. ANS: Both of these choices.